Are We Writing Off Cursive? Every year, I write a letter to each of my daughters on their birthdays. On a piece of stationery, I recall some of my favorite memories. My intent has been to provide a sense of who they are, what they like, and how they choose to spend their time so their future selves will know. The sad thing is, in recent years, I’ve realized that if I don’t help them with their handwriting, my children might not be able to read the keepsakes I’ve penned. They’re written in cursive. Cursive writing instruction has been on the decline since the seventies. Some blame technology. Others point to education initiatives, like the Common Core, which fail to include cursive writing in its standards. Luckily, the debate of whether schools should require children to learn cursive isn’t waning; for many people understand the value for cursive beyond a signature on a check. In fact, earlier this year, Ohio enacted legislation to require cursive mastery due to its many benefits, and six states are now following suit. Contrary to what many believe, printing and typing do not produce the same results as cursive. 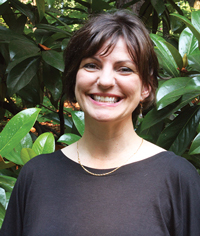 Virginia Berenger, a psychologist at the University of Washington, illustrates why through her research. Brain scans indicate different parts of the brain are used during the different writing tasks – manuscript, keyboarding, and cursive. Therefore, limiting a child’s exposure to one of these areas has consequences. Murray supports Maria Montessori’s belief: Hands are the tools of the mind. This progressive physician and educator was the first to see the correlation that research now backs up. That explains why when students enter Montessori programs, they participate in a variety of tactile lessons designed to strengthen motor mechanics. This ultimately prepares them for writing by hand. Think pouring water from a pitcher, grasping beads for jewelry, and kneading play-dough into sculptures – messy tasks families today may be spending less time with or skipping in favor of cleaner electronic entertainment. “As a mom and lover of my iPad, I can relate to loving the quick to-set-up, easy-to-engage, and no-mess benefits of electronics,” says Allen, the OT. “But our children’s brains deserve better! No parent would opt for an interactive app where they get to pretend to receive a pedicure or massage over a real one, right? Children actually want to climb real trees, dig in real sand, mix real cookie dough, and dip their hands and feet in squishy finger paint. 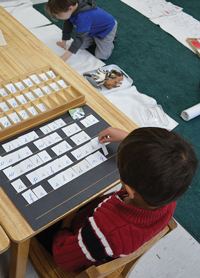 The sensory information they get from these real experiences will build their language, cognitive, social, and motor skills.” That’s why parents need to encourage writing with a real-live pencil, versus tapping letters or keying in text since it’s a crucial fine-motor sensory exercise. A 2012 study by psychologist Karin James at Indiana University compared students who wrote letters and students who watched others write letters. According to James, the act of handwriting stimulated the brain’s motor pathways, which facilitated reading acquisition. How exactly? Well, one explanation points to the fact that since cursive writing requires the linking of letters, the writer can’t simply focus on the formation of a single letter that’s typical in printing. Rather, she must anticipate the next letter to ensure that they are connected correctly. This awareness of the letters in relation to each other is important when learning to read. And it’s something kids don’t get when printing, typing, or texting. In a recent article, “The Pen is Mightier Than the Keyboard,” psychologists Pam A. Mueller of Princeton University and Daniel M. Oppenheimer of the University of California, Los Angeles, reported that students learn better when they take notes by hand than when they type on a keyboard. When you take handwritten notes, you can’t write everything, regardless of how fast you may write in cursive, so you must prioritize what you’re hearing and record what’s most important. Doing so requires higher-order thinking skills, which help students learn the information. Since many students do type quickly, note-taking becomes an experience similar to dictation. It’s what Mueller and Oppenheimer refer to as verbatim transcription, which requires low cognitive processing. As a result, taking notes on a computer prevents the learner from prioritizing information and gaining a deeper understanding of it from the start. Furthermore, Murray says, “Students who learn cursive don’t mix up letters, as they might when learning manuscript.” Why? The cursive “b” and “d” are very different. As a result, Murray says, “You can pick up on dyslexia or dysgraphia early on.” It’s also worth noting that cursive therapy is now being utilized to assist students diagnosed with both learning disorders because it helps children associate sounds and, in particular, blends more efficiently. 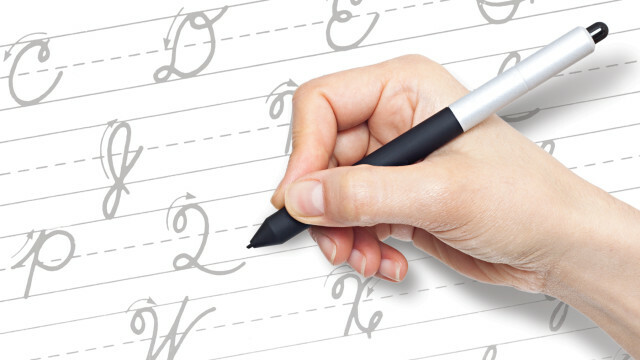 For the older student, Murray explains, “Cursive writing allows for flowing expression of thoughts and cognitive reasoning.” Research from psychologist Virginia Berenger supports this as well by demonstrating how cursive writing enables students to express more substantial ideas than when composing on a keyboard. Peter Elbow, author of Writing Without Teachers and professor of English emeritus at University of Massachusetts Amherst, explains writing on a computer disrupts the student’s process, as the writer stops his production of thoughts in order to correct mistakes indicated by red or green squiggly grammar and spell-check lines. This tendency to edit while drafting inhibits the development of ideas – something this English teacher and writer has experienced firsthand. Ultimately, however you feel about your own handwriting or whether you still write in cursive, when discussing English language standards, cursive writing must be part of the conversation. Whether you want your child to have an academic advantage in a lecture hall or just hope your kids will be able to read letters from their grandparents, it’s time to consider the cost of cutting cursive writing from curriculums before it’s too late. Want to help your child with cursive at home? Start by making sure your child knows how to grip a pencil. According to Allen, “While a dynamic tripod grasp is considered a more efficient way to hold a pencil, there are quite a lot of variations in the way people hold their pencils and there is research suggesting that this “proper grasp” is not essential for good handwriting speed or legibility. There is no need to fret if a child has an unusual grasp if they produce good writing in a timely fashion and do not complain of pain. However, if a child struggles with managing a pencil to produce grade-appropriate writing, they may benefit from activities to strengthen their fine motor skills or consideration of better tools to fit their needs. Third grade may be considered a closing of a window because habits have been formed that will be hard to break and because the tremendous amount of neural growth that occurs in early childhood starts to slow about the time of third grade. An occupational therapist can help with this. Previous articleCommunity Colleges and You!